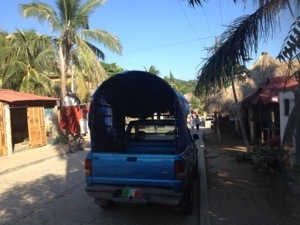 Getting helped from three spanish macho strangers to load our backpacks on the back of the pick up truck is such a relief, especially down a burning sun and having to surmount other passengers onboard with their bags and backpacks. Giorgio is the guy who had replied to my, “is there enough place for two”, directed to the driver, with an”sure, come i will make space for you”. A curly blond haired, light blue eyes, lovely smile and naughty boy look; it took a while to understand his multi cultural roots : argentinian-brasilian parents, with lebanese blood and conceived in Milan therefore named with such an Italian name, Giorgio. He is also yacht capitain, like the guy met in Mazunte, Andrea. At the moment he is based in Puerto Escondido, but he will be wandering around Mexico with two lovely friends, David and Eduardo. 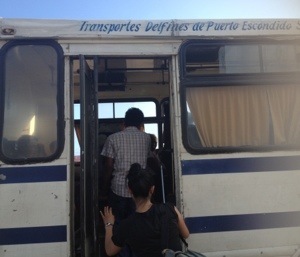 They had all spent a night at Mazunte for the jazz festival and were returning to Puerto Escondido with us. Just outside mazunte we took the bus ” trasportes delfines” and had a funny 40 minute journey with no other tourists than us, the rest of the people were mostly locals with large bags with food or clothes, who probably all were beach vendors. 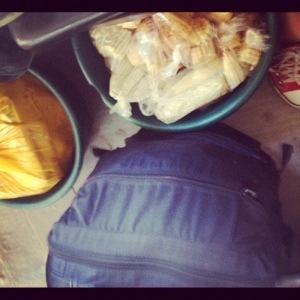 I had a big woman beside me with a big bag full of corn and various other stuff. Despite the dirty appearance, the corn looked fabolous and inspired me for a corn on the cob later. 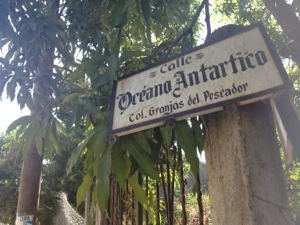 When we arrived at our destination, the guys, all so nice and easygoing, offered to help us in finding accommodation but we finally decided to go to a hostel that had been recomended by Elisabeth, the austrian girl who was with me in Patzcuaro and who had stayed there few nights before. 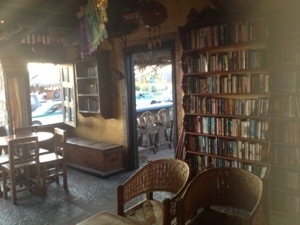 While finding a wi-fi spot to find the address of the hostel, i found this beautiful, cozy bar called “Casa Babylon”, a cool little library/ bar with many mexican masks hunged and a big selection of books to exchange. This is another interesting topic. Even if i love reading, I did not take any book with me first of all because in my spare time i knew i wouldn’t have had time to write my blog, but also because i didnt want to carry more weight in my mini backpack. But most of the travelers I met, they were carrying at least one book, sometimes rather big, and often they exchange it in bars like Casa Babylon or at the hostels. It reminded me of the “Bookcrossing”, i wrote about it in one of my first entries, it’s defined as “the practice of leaving a book in a public place to be picked up and read by others, who then do likewise”. i found this book exchange kind of romantic too. While looking at the books and observing the different languages offered, i tried to imagine the stories behind those, not the one described by the authors but those of the persons who had decided to leave their books in the hands of strangers. I was totally absorbed, but i was interrupted by the waitress with my amazing cinnamon, ginger and honey tea. I felt so comfortable in that place, it was so cozy, and i liked it so much that i would go back to that bar at least twice a day in the following days, either for a coffee or tea but also for its popular mojitos at night. The hostel was ok, but me and my lovely canadian\travel mate, Soo, had spent nearly a week in a very quiet and wild place and we decided that we would spend just one night there and the day after we would have moved to Zicatela. We first had a tequila at the hostel but then headed to zicatela for some food and for a possible meeting with Giorgio and his friends. I was craving tacos al pastor but since i had been sick lately i was a little bit concerned of eating them or not. I was just in front of the Taco place, looking at a small guy cutting the meat from the spid; a guy from behind was observing the scene and listening to my doubts. He came closer, and told me i should eat them since they were amazing and he had it thousand times. I turned to see him and i found a lovely handsome young guy with a huge smile. You could tell from miles away he was a surfer: long hair, sporty outfit , kind of wild appearance and very tanned. Hunter was his name, but i would call him Hubert for the rest of the night. He bought lots of tacos and invited us to try them before to decide if having them or not; we crossed the street and sat on a low wall on the beach. The tacos were buenisimos, nearly as good as those eaten in Cholula with Andres, and me and Soo went to buy a dozen more while Hunter went for three Dos Equis beers. 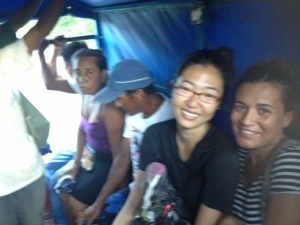 We cheered up and once again i was enjoing that easy way to meet people when traveling. To listen and enjoy their stories, Hunter was from Canada, and since he was born his parents would drive to Puerto Escondido all the way from Canada, and stay there at least one month every year. I immediately imagined this happy canadian family driving thousands of miles in a big car with surfboards on the top listening to folk music and talking all together about whatever topic. I wonder if it happens to other people to fantasize on peoples other stories and doing it so well that it suddenly seem true. I am actually one of those persons. 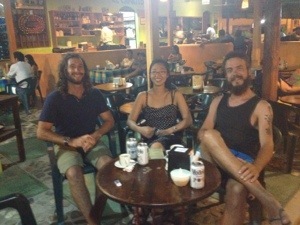 While having a lovely espresso coffee after the tacos at the best cafeteria in Puerto Escondido called Cafecito, we bumped into Hans, a norwegian guy that me and Soo had met at the posada del arquitecto in Mazunte. Again, what a coincidence. But just when we were talking about this matter, i saw walking on the street three familiar faces: Justin, Paul and Kevin, the three guys i was writing about in my entry “a walk, a fly to Michocan.Frida”; i had met them at the Barefoot Hostel in Mexico City ( about 750 kilometres away). I dont know if it is simply normal but i find it amazing to bump into other travelers i have met in other cities and places, days or weeks before. I had a quick chat with them about the recent travels and i kissed them goodbye, and the three of us, Soo, Hunter and I went to Casa Babylon. 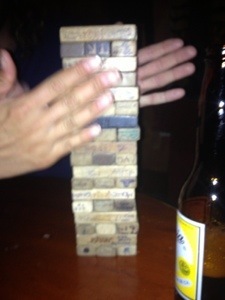 We played Jenga and had a delicious mojito. Seriously, delicious. There was nice music but we crossed the street where we were supposed to meet the spanish guys at Kabbalah, a cool bar with white beds and tents on the beach. Latinamerican music: again, i am not a big fan of this but i fascinate seeing good dancers moving sensually and perfectly syncronized to the music, and at the same time have fun looking at the clumsy ones! Soo delighted us with a great performance with a local aged dancer. So funny! I had a drink there, but i was so badly craving to dance something more of my style, i wished for some electronic music. He who seeks shall find: I asked to a guy on the street who suggested to us, Bar Fly: another popular spot in the Puerto Escondido nightlife. At the beginning it sounded too commercial to me, but more and more the two djs really similar between eachother, probably brothers (skinny and with long hair and similar features) started to play cool music. Might have been the forced abstinence from dancing in the past weeks, but i started enjoying music and dancing on my own. When i dance on my own i dont really see anything around, Soo didnt really appreciate that kind of music but tried her best, while being stopped from different weirdos asking her ( as usual ) if she was from China or Japan. I lived that moment so many times: people look at her as an exotic doll, and everytime she would reply to them: i am canadian, but my roots are Korean. And everytime she would look at me annoyed and frustrated. She would say: there is not just China and Japan in Asia! I would smile at her saying she is exotic in mexico, making her smile again. In fact, i did not really noticed many Asian people in Mexico. I did not receive those kind of weird types of questions, but a cute guy came and told me he had just recognized the same dance move and the enjoyment on my face at Casa Babylon. Sweet eyes, tanned, big smile, tall and athletic body. 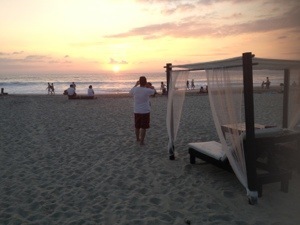 He had driven from Mexico City with his nice friend and surf fanatic Victor, for a long weekend in Puerto Escondido. From his name, i would bet he had some arabic roots and he told me his dad was lebanese, showing me his name in arabic tatooed on his shoulder. I told him about my lovely lebanese friend in London called Farah, one of the funniest persons i have ever met. I wished she was there with the other “parrots” (girlfriends) and we would have fun talking about lebanese “deliveries”. Those two guys from D.F. reminded me a lot of the Patzcuaro neighbours, for the way they speak, they dress, their taste in music, and for instance their similar age… Again! I learnt some new mexican slang words this night, which i’d better not repeat! But we danced and talked until the club closed doors and the djs delighted me with “Bombay” from El guincho as the last track of the night.